SA Remote is the official iOS app that allows real-time viewing of 3-DOF and 6-DOF spatial data from SpatialAnalyzer® (SA) and allows remote control of the SA Laser Tracker interface. Available for free download at the Apple App Store, SA Remote can run on your iPhone®, iPod® touch, or iPad®. Here at New River Kinematics, we’ve found that an iPod touch makes the perfect SA Laser Tracker remote control. SA Remote has recently been updated to work with iOS 11, read below for more details. 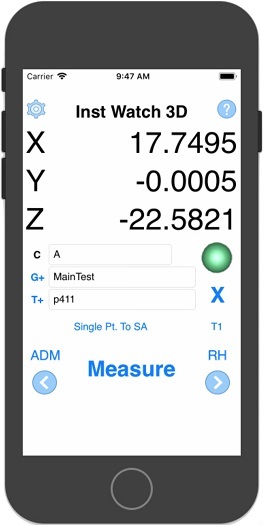 SA Remote is the official iOS app that allows real-time viewing of 3-DOF and 6-DOF spatial data from SpatialAnalyzer® (SA) and allows remote control of the SA Laser Tracker interface. Available for free download at the Apple App Store, SA Remote can run on your iPhone®, iPod® touch, or iPad®. Many n SA users find that an iPod touch makes the perfect SA Laser Tracker remote control. Already very popular amongst SA users, SA Remote saves people time and effort on the job. SA Remote was recently updated for compatibility with iOS 11 and now requires iOS 11.4 or later. See the OS compatibility matrix for more information on compatible devices. The primary change in the update was building the app 64-bit, which is a requirement for all iOS 11 apps. Other updates include an updated UI layout to support varying device sizes, background color and view transition consistency, bug fixes, and much more. Interested? Visit the Apple App Store to download SA Remote for free today. SA Remote will receive UDP data for display from watch windows in SA or the Laser Tracker interface on port 10000. If multiple sources of watch data are available, the SA Remote allows switching between the sources allowing selection of which watch source on which to focus. When viewing/controlling the SA Laser Tracker interface, the IP/hostname of the computer running the SA Laser Tracker interface must be entered into the app in the settings page. Once this is done, SA Remote will provide display and control over the interface remotely.